Every driver using DAB radio experiences sharp breaks in reception, especially in hilly country areas with relatively weak transmissions. And, of course attempting to retune to catch vital pieces of commentary is extremely dangerous. 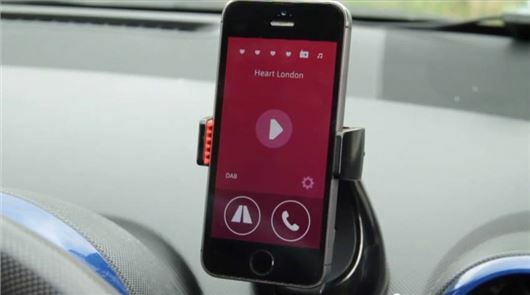 Now Radioplayer, the online listening platform run by the BBC and commercial radio, has launched a prototype hybrid car adaptor that enables listeners to get maximum choice of radio stations, with minimum tuning fuss. The device scans DAB, DAB+, FM, and internet sources, automatically selecting the best platform to deliver any station. If a signal is lost, it switches seamlessly to the same station on another platform. The prototype in-car adaptor has been developed in conjunction with Connects2, a leading automotive audio firm based in the West Midlands. The small device, fitted behind the dashboard, is controlled by a dedicated app on the driver’s smartphone which, positioned safely in a dashboard cradle, acts as the radio interface. Safety is a key factor in its design, which is as simple to use as a car radio. A listener can swipe anywhere on the screen to move through their pre-set stations. A voice identifies each station, to minimise distraction. A tap anywhere on the screen stops and re-starts the radio. Using the system, drivers can also ‘Bluetooth’ their own smartphone music collections, take hands-free calls, listen safely to inbound text messages, and receive instant audio travel news, customised by GPS to their location and direction of travel. With 20 per cent of radio listening taking place in the car, and some 27 million UK vehicles still not able to receive DAB radio, this technology could present a solution to one of the biggest hurdles faced by the radio industry, in the move towards digital. Radioplayer is working with the leading manufacturer, Connect2 to produce the adaptor and expects the retail price to be between £100-£150. Radioplayer and Connect2 are currently in discussions with a couple of the major retailers to stock the product and hopes to be able to bring it to market within 3-6 months. Designers are told to simplify, and slickify. Nobody wants all this in one ugly box, hasn't the Apple experience registered yet? Back to the lab with this one and set new targets: wireless installation, price point £75, touch screen, and no need to use a phone. There are lots of very good product designers about, really there are, so why not consult with one or two?